eXpress modeling provides a unique method of capturing the functional design of a system. Functional system models can represent many different types of system architectures and components: electrical, electronic, mechanical, fluid and many others. A well-developed functional model can be used for diagnostic design, diagnostic analysis, failure analysis and critical safety analysis and can be quickly updated as the design evolves and changes. System modeling involves adding all the components that are testable or replaceable at the level of repair. Component below the level-of-repair do not need to be included in a good system model. For the purpose of analysis additional components may be added for FMEA and FTA analysis which are not required for the diagnostic design analysis. eXpress is well suited for large, complex and critical systems. As an example the system model statistics shown below consists of many subsystem level model within multiple levels of hierarchy. The system model has over 1,000,000 functions and over 380,000 test nodes. A dependency model is created by adding in all the functions of the components and then building the functional relationships between the functions of the design to represent how function flows through the design. Failure modes are then added to the components to define how the components and their associated functions will fail. 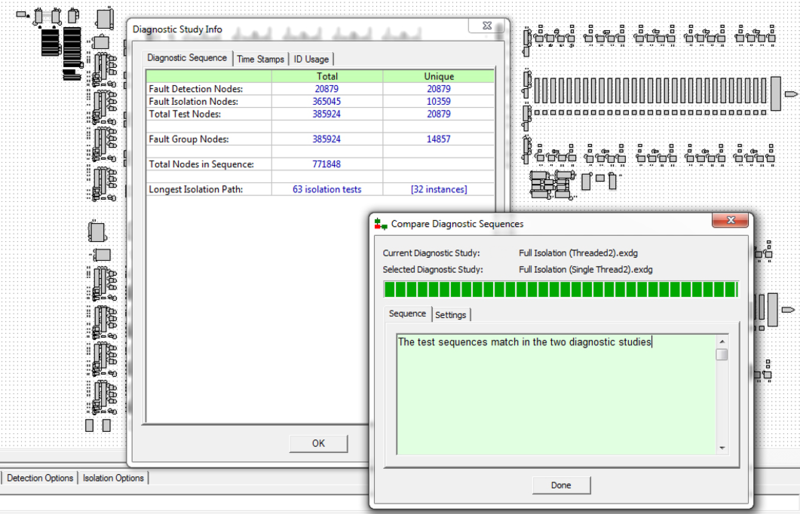 The dependency model once created then can allow for quickly and accurately defining the tests that will be used by eXpress diagnostics. Tests in eXpress are used not to define the physics of how things fail by rather what is learned diagnostically when a test passes or fails.